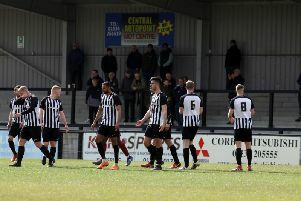 Corby Town made it an unbeaten start to the new Evo-Stik South League Division One Central campaign as they followed up a 1-1 draw at Cambridge City with a well-deserved 1-0 victory over Sutton Coldfield Town at Steel Park. A clean sheet! The Steelmen look solid. Clean sheets weren’t exactly Corby’s forte last season. This result prompted me to have a check of the records for the last campaign and, after this solid defensive effort, the Steelmen are already a quarter of the way towards matching how many clean sheets they kept last time out. It sounds all-too simple, but if you don’t concede a goal then you don’t lose matches. And if this display is anything to go by, there will be plenty more to come. It shouldn’t come as a surprise. The additions of seasoned performers like Gary Mulligan and Miles Smith were always going to solidify the back-line and Corby looked a solid unit last night. There were question marks over the goalkeeping position over the summer but Dan George has been given the opportunity and did everything he had to do well on this occasion. The early signs are good when it comes to the Steelmen’s defences. Connor Kennedy isn’t renowned for his goalscoring, indeed his match-winning effort in this game already matches his goal tally for the whole of last season. But the 19th-minute header was a pleasing moment for the full-back-turned-midfielder and he went on to produce a man-of-the-match display as he hustled and bustled his way around the pitch, making plenty of tackles along the way. Kennedy is still perfecting the role of a holding midfielder but his aggressive nature is no bad thing, even if it does mean a few yellow cards along the way. If he can add further goals then he will only enhance his growing reputation. You must take your chances to make things that bit more comfortable. There wasn’t a great deal wrong with the Steelmen’s performance but they could and should have made it more comfortable. There were enough clear-cut chances to give them the scoreline their display deserved. Thankfully, their defence ensured Sutton didn’t find a way through but one lapse would have seen all the hard work undone. If the chances come along, take them. A shorter season so there’s no time to waste. There will be just 38 games for Corby Town in the Evo-Stik South League Division Central following the restructuring during the summer. And that makes a good start vital. Teams are showing their hands already. Bromsgrove Sporting get big home attendances and they put 11 past Kidlington on Tuesday night while Bedford Town are believed to have invested heavily and are one of the five teams to have a perfect record after the first two matches. It already looks like the teams you would have expected to be up there are making their early moves. And, after picking up four points from two tough tests, Corby are up there with them. Good start must be taken into the FA Cup. Ah the FA Cup! I am not sure chairman Stevie Noble will care how Corby win when they play Dunstable Town in the preliminary round at Steel Park on Saturday as long as they do. When someone mentioned to me that it had been four seasons since the Steelmen last won a game in the world’s most famous club knockout competition, I found it hard to believe. But that is most certainly the case. You have to go back to October 26, 2013 to find Corby’s last victory in the FA Cup - a 3-1 success at Colwyn Bay (I’ll buy a pint for the first person who can name me the goalscorers without looking them up). Since then, it has been total misery with Corby exiting at the first hurdle they entered at on each occasion.